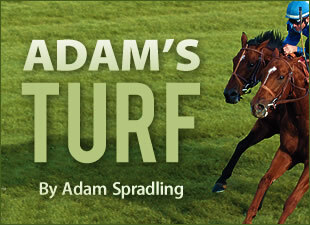 So I wandered over to the ol' sale grounds of Keeneland for an hour on Monday September, 8th. Man, what a learning experience the journey turned out to be. 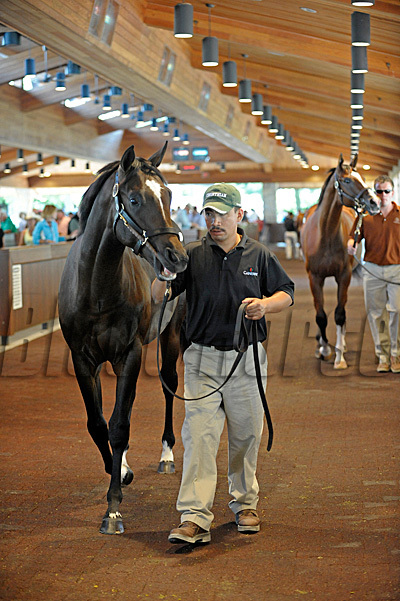 The most exciting aspect was to see how hot A. P. Indy was at this sale, just on the first day alone. To watch the pedigrees of all the horses offered and discover what sires people were fond of and who was getting the highest bids was interesting. Not too long after I arrived, hips 125 and 126 came through. Hip 126 sold for 1.7 million dollars, being an Empire Maker, but chump change compared to the next hip I bore witness to. 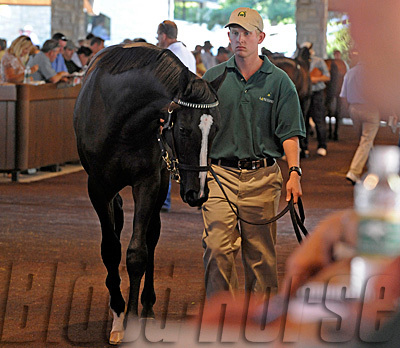 Hip 127 strolled out while I was looking at horses at various consignors and farms, talking to a few workers I knew. Then while conversing we hear over their headpieces, "$7 million!" and everyone at all the barns dropped what they were doing and ran to the teleprompters/barn televisions. It was a beautiful yearling of Horse of the Year Azeri. Vallenzeri (Azeri's first foal) was looking good and man, I don't blame the $7.7 million bid...but yet it was RNA! RNA means Reserve Not Attained (met), which basically means you have to hit a certain asking price in order to purchase the horse. Vallenzeri was a buyback, a Keeneland record buyback in fact. Don't you love being a part of history? I strolled over to the Sales Paddock and the Sales Pavilion from the calamity at the barns and along the trip, who else did I meet? Vallenzeri . I have this sweet new phone that takes pics and vids, so I got a great picture of the lovely horse, even more beautiful in person. The Sales Pavilion was crazy. People everywhere and horses everywhere and organized chaos of sorts. There were horses lurking around the sales paddock outside, strutting their stuff for onlookers. There were a lot in the paddock and I actually thought there maybe too many, because they had to constantly keep their distance from each other...even though the sales paddock isn't small. After watching horses and observing people observing horses, I wandered into the indoor sales paddock, where two horses were frolicking about. The indoor sales paddock was much smaller, thus only two horses walking around in a circle. One of the horses had to do some business and I watched the brooms-man execute some ninja like moves to scoop up that business on the ground. He had to make sure he did not disturb the horses; especially one of the horses had shown some attitude a bit earlier, so being behind that heavy animal was not the most comforting place at this time, I am sure. A Tale of the Cat was causing the ruckus, then the other horse in the paddock started causing a ruckus, they learn from each other so fast. The horses were bucking up and we people along the rails had to jump back to avoid hoof face. From this paddock you go into the sales ring. It is basically a modest auditorium with comfortable stadium-like seating and nice ring for the horses to be handled in. Anway, I went to watch these horses be auctioned, so I can witness the auction call and see if these horses almost jump over themselves, like in the paddock. One horse was very whiney. The other was just a beautiful steel gray with red tint, so I was lost in the coat of that beauty. Both sold fine and one was interested in the crowd and the other was interested in kicking faces. Watching Fairplex race 6 on TVG the other day, I learned a really interesting tidbit I must pass along. There was a horse named Guts in this race. Now you think I mention him because of his name being Guts, but you are wrong. It turns out he has been renamed. On his first start, he was under the name of Nutzapper. AND if THAT isn't great, he was renamed because he was gelded. So Nutzapper became Guts after a gelding.